As we’re all aware, compost week-or weeks, shall we say, has been a main focus of BSC lately. If you spent any time shoveling, sifting, or packing, you may have noticed a number of compost critters, or “friends”, living amongst the piles. Alas, we’re referring to millipedes, roly polies, collembolas, snails, bacteria, worms and more! Verily, they make compost what it is, but, how well do we know our friends? What do they like to eat? What characteristics make them unique? What do they look like? How do they interact with each other? See the attached ‘Compost Critter Information Sheet’ to get acquainted. Whether you’re composting at home or in a classroom, this is a resource for identifying different creatures and their individual benefits for your compost pile! For this week, we’d like to report on a topic that our operations manager Faith recently brought to our attention, Bokashi Composting. It’s quite a bit different than the ‘backyard’ composting we’re used to, but still a method commonly put into practice. For starters, meat and diary can be composted. Food scraps are fermented, thus the organic matter should have as little oxygen as possible. We’re used to turning piles, making sure they are aerated to facilitate decomposition. In Bokashi, a bran containing microbes is spread on top of scraps, rather than allowing nature to do it’s job. Have any of you tried this before or know someone who has? Read here to learn more about the history and use of Bokashi. For those of us emptying buckets, picking up bags from commercial accounts, checking inside buckets, ‘compostable’ cutlery or ‘bioplastics’ is a familiar sight. What are bioplastics exactly? How are they manufactured and are they really compostable? Is it clever marketing or an effective strategy for greener production and dining? Bioplastics, simply stated, are plastics derived from renewable biomass sources, such as vegetable fats and oils, corn or pea starch and microbiota. They come in forms like packaging, pots, bowls, cutlery, bags, and even in mobile phone casings, plastic piping and carpet fibers. The term ‘bioplastic” means plastic that has been created from a biological source. This can be misleading as folks can assume that “bioplastic” equals “biodegradable,” which in many cases is incorrect. In comparison with the production of common plastic, bioplastic requires less fossil fuels and creates less greenhouse gas. Petroleum is used in the production of both, however, its possible to create bioplastic with renewable energy and zero petroleum. Consequently, there is concern that if the demand for bioplastic spikes to a global level, this will lead to increased deforestation and soil eroison. And so you see, there is much debate regarding bioplastics especially since there are different types (starch-based, cellulose-based, polylactic acid, poly-3-hydroxybutyrate, polyamide 11, etc) each with it’s own environmental pro’s and con’s. 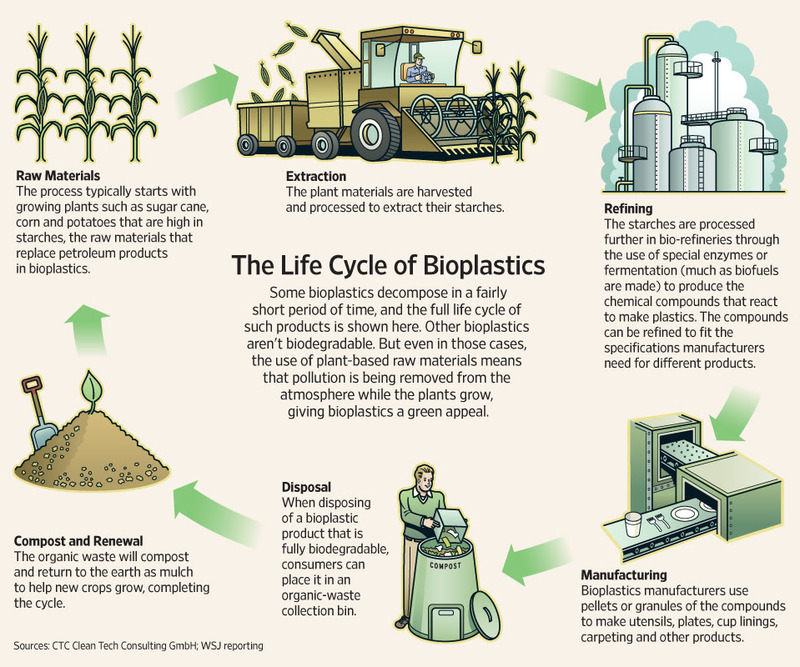 In terms of the breakdown of bioplastics, which is where Bootstrap comes in, see this article for details: http://www.triplepundit.com/2014/12/breaking-bioplastics. “Not all bio-based plastics will biodegrade and not all biodegradable plastics will compost,” the author states. It seems we have a way to go until the production and breakdown of bioplastics is perfected. In the meantime, we can be active, educated consumers, ensuring our dishware goes to the correct stream for the correct processing. Fortunately, Bootstrap sorts and removes any non-compostable bioplastics from our stream. Those which are compostable are sent to our friends at partners at composting facilities. Booya! 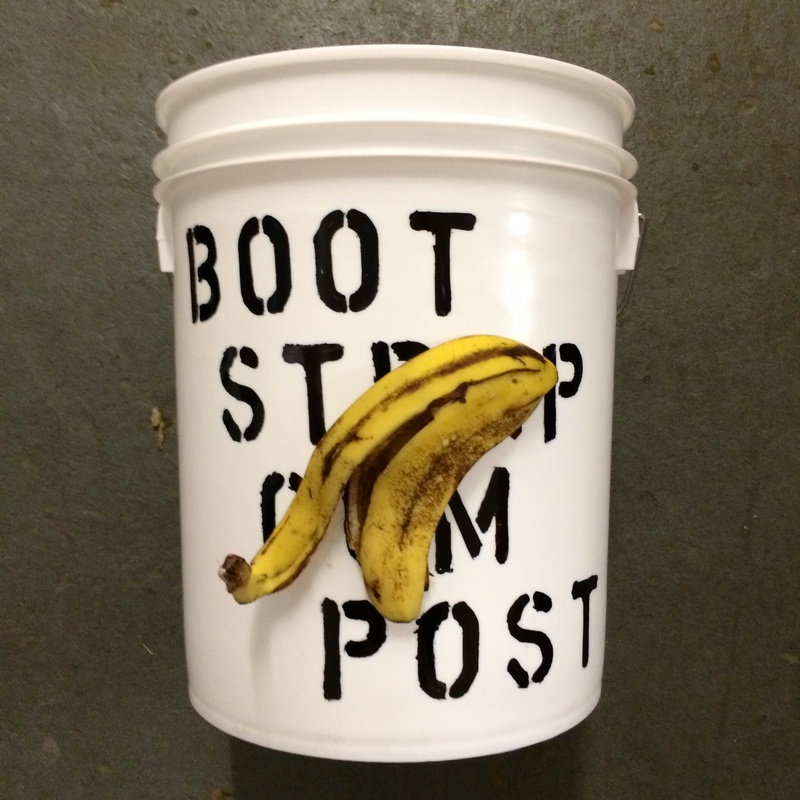 Today we thought we would take a moment and highlight our star food scrap, the banana peel. From our experience, at least half the buckets we collect have these suckers in ’em at any given time. Why, oh why, you may ponder, is this important? Did you know that 25% of peels are thrown into landfills, resulting in the emission of methane, a harmful greenhouse gas? Americans eat 304 bananas every second – 12% of a banana’s weight is it’s peel, meaning over 780 million pounds of peels per year are on their way to the landfill to release over 740 million pounds of harmful GHGs. Fortunately our savvy Bootstrap compost warriors are making a big dent right here in Boston. But how many of us know what else we can do with our peels, in addition to composting? Check out this awesome info-graphic, created by Sustainable America, to find out the many uses of a banana peel. And watch this 3 minute video to learn how to make banana peel fertilizer! It is the liquid extract of compost that contains plant growth compounds and beneficial microorganisms. It is NOT leachate, the dark-colored solution that leaks out of the compost pile, or the juice found in worm bins. The healthy bacteria and fungus in compost tea protects plants from diseases. It can add key plant nutrients and microbes to soil without adding bulk (good for rooftop, balcony or container gardening). Compost tea is a way to maximize your compost resources to perform a more widespread application. Compost tea can be applied once a week to the leaves or root zones of plants with a pump sprayer or watering can, ideally within two hours of the brewing process.